When Lindsay Riley, patient services representative in allergy and immunology, took up running in 2011, she wanted to experience the excitement of an organized race. But as her life got busier, running became less about the competition and more of an outlet that gave her focus, determination and time for herself. When Lindsay did compete, she ran 5k races. 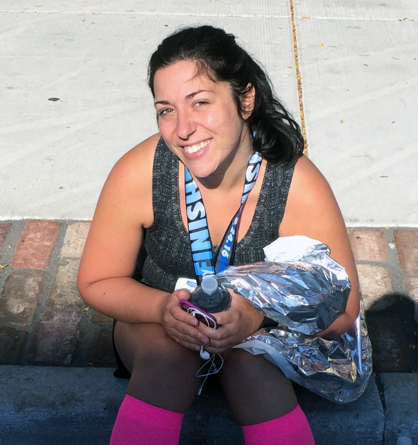 “After I ran my first 5k, I wondered if I could run longer distances,” she said. 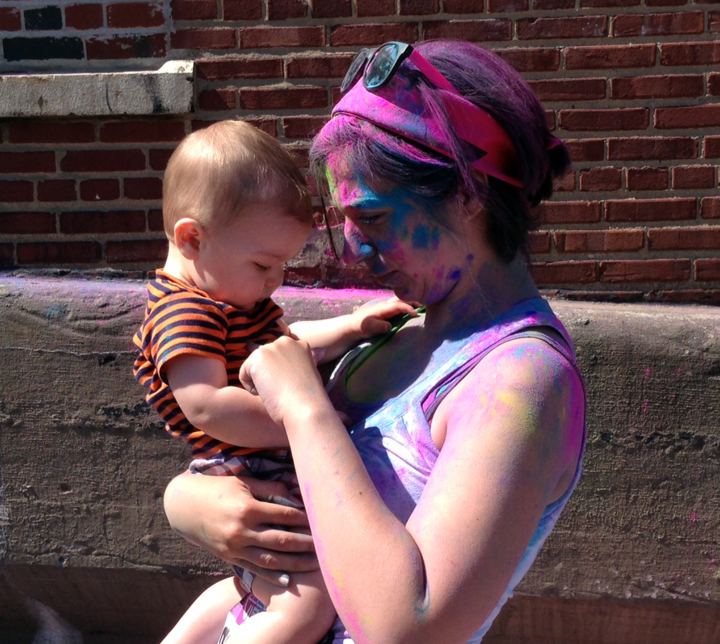 Parker checks out his mom, Lindsay’s, bright colors at the finish line of the Akron Color Run several years ago. Lindsay put the thought on hold for 3 years. 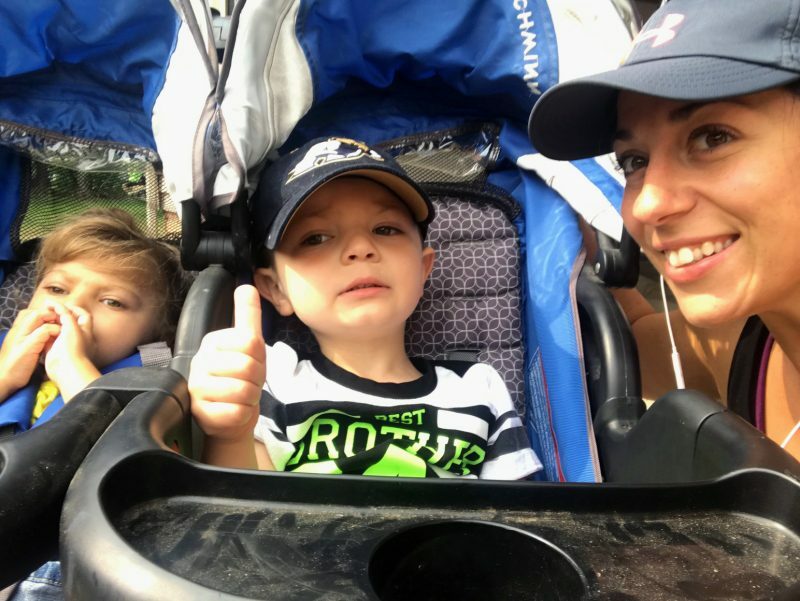 After her second child was born in December 2015, however, Lindsay registered for the Akron Children’s Hospital Akron Marathon Race Series. 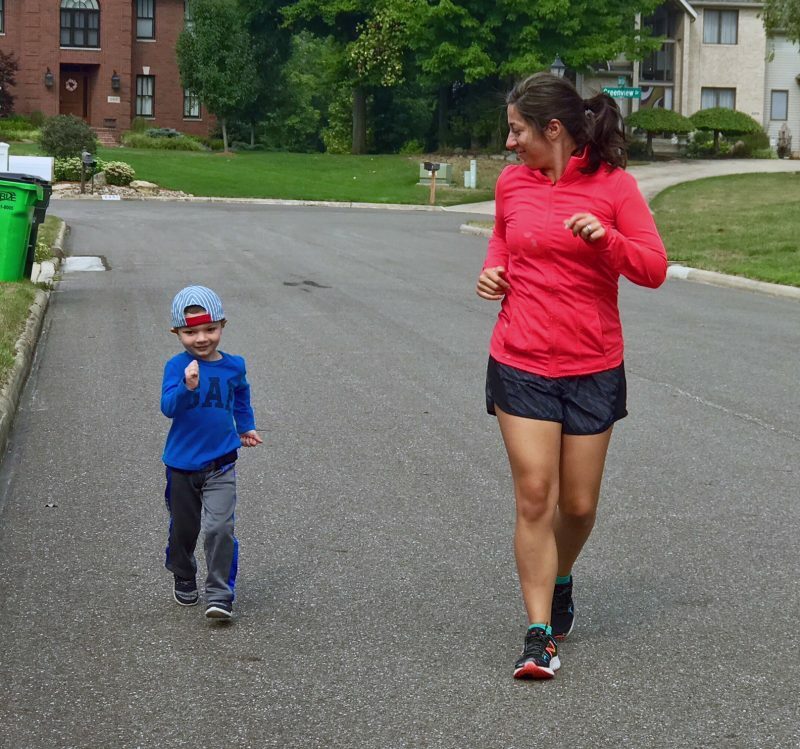 She planned to run her first half marathon in the September 2016 First Energy Akron Marathon, Half Marathon & Team Relay, and figured that by registering, it would jumpstart her running program again. Training for a half marathon requires months of preparation to build endurance and avoid injuries. Because Lindsay hadn’t run for awhile after giving birth, it was like starting her running routine all over again. Things didn’t go as Lindsay planned, however. Soon afterwards, her 7-month-old baby girl was diagnosed with cerebral palsy and a rare genetic disorder. With this news, Lindsay didn’t think she could run the race. With 6 weeks left to train, Lindsay ran almost every day to prepare. Lindsay’s first half marathon is in the books! Here, she’s trying to “regain some composure” sitting on the sidewalk outside of the stadium. The 2017 First Energy Akron Marathon, Half Marathon & Team Relay was a different story for Lindsay, who again ran a half marathon. Sometimes Penny and Parker ride along on “super-fast runs” with mom, as Parker calls it. Lindsay plans to run her third half marathon in this year’s event on Sept. 29. Her fitness routine includes waking at 5:30 a.m. before her children are up so she can either run 3-6 miles several days or strength train 2 mornings. On weekends, Lindsay goes on long training runs. By working hard to gain control over her family’s situation, Lindsay said she feels like it’s made her a better mother and person.